For our corporate clients and agencies, we offer a set of Business accounts with extended limits and additional account features. 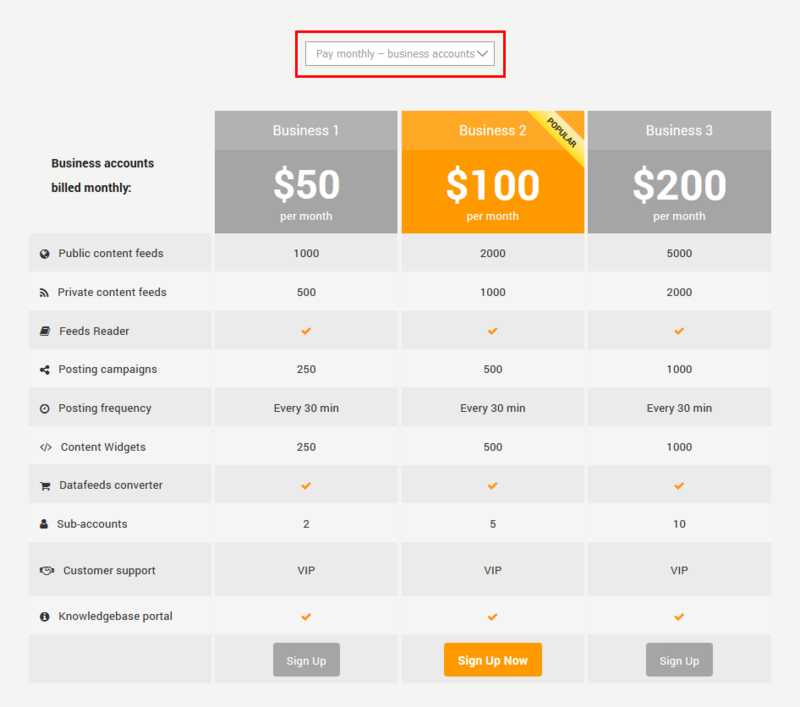 You can sign up for one of our three Business accounts with monthly or annual billing cycle. Use a drop-down option above pricing table to find a detailed description of each plan. Along with regular features, like access to Feeds Reader, content feeds search and generation, autoposting campaigns, content widgets, datafeeds to RSS conversion, Business accounts will have unique functionality. One of them is an opportunity to have several sub-accounts. Sub-accounts are used to separately run different content management projects or to serve a separate customer. For example, if you are an agency and you keep updated social network accounts for one of your clients, you can create a separate sub-account for your client and run it as a part of your Business membership plan. Each sub-account will inherit all features and limits after your Business plan. To set up a new sub-account press Add Sub Account button. 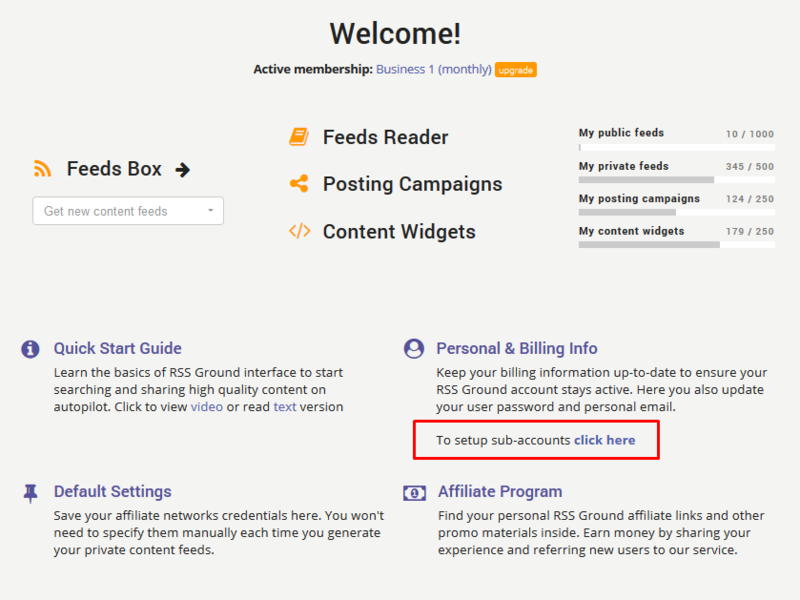 Now you can set an existing RSS Ground account to be your sub-account. Start typing RSS Ground username in Existing Username field. 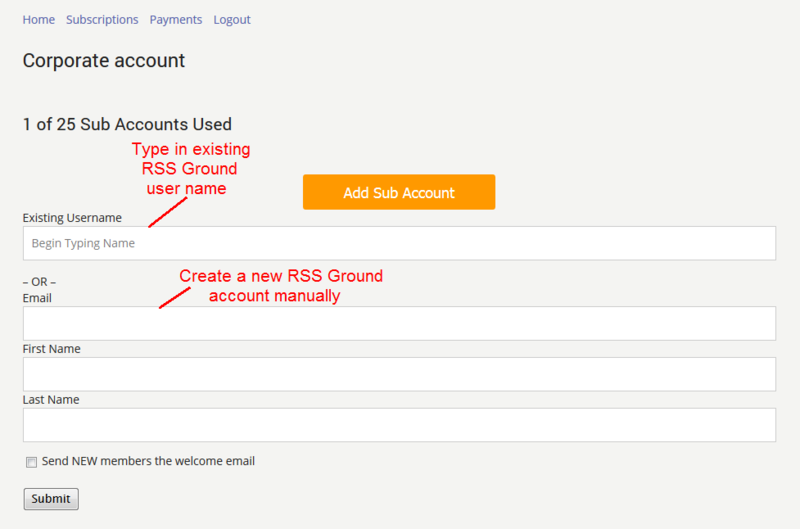 Or you can create a new RSS Ground account specifying new user email, first name, and last name. New user will receive an invitation email with a temporary password. Existing user will use his current password. All your sub-accounts will have the same membership level as your original account and they will share your membership limits. However, they won't be able to create their own sub-accounts. Business plans will have not only extended limits for a number of content feeds, posting campaigns and content widgets, but also have additional options not available at personal accounts, like 30 minutes posting frequency. If you still think that Business plans limits and options are not enough for your projects, we are always ready to meet your needs using a personal approach. Just contact our support team and describe your estimated turnover and we will offer you an individual membership plan.